The Trans-Pacific Partnership (TPP) has been a hugely controversial agreement which has drawn backlash from many. While it seems that governments around the world are only concerned with how to ratify it, many have sent strong messages saying “No”. Today, we wanted to highlight some of those protesting in the country of Peru. We continue the headline making TPP with more coverage from Peru. Back on November 5, the official text of the agreement was released. As this affected digital rights, we published our own analysis of the agreement. That analysis focused on the controversial Intellectual Property chapter. While we did unearth a number of provisions that have startled digital rights advocates and organizations, this is simply a small taste of what the TPP affects. Since then, the agreement has drawn fire from just about every civil rights organization and advocate all around the world. The protests against the agreement, naturally, also swept across the world as well. This includes a nation-wide protest that swept across the United States. A big reason why the protests became such a global phenomenon in such a short period of time was not just because the agreement has an impact on digital rights, but also over a wide range of areas from national sovereignty to environmental concerns, the power of multinational corporations, a countries legal system, commerce, food security, indigenous rights and just about everything else. So, when a trade agreement has such a wide-ranging impact on not just one, but many countries, people will take notice. If they are unhappy about it, they will have no problem voicing their concerns. Still, a number of governments are seemingly only asking the question of how they can ratify the agreement in spite of such a loud and unanimous chorus from non-multi-national corporate interests. This plays well into the narrative that governments are not acting in the interests of the people of the country, but instead, are focusing on serving major corporate interests. This narrative was made clear especially during the signing ceremony back in February 4th where all 12 countries signed off on the agreement. While it hasn’t even been a month after the signing of the agreement, the government of Peru has already said that they intend on tabling the agreement for the purpose of voting and ratification. People, groups, and various organizations gathered in Plaza San Martin in downtown Lima late in the afternoon. The same happened in various squares and parks in cities such as Piura, Chiclayo, Cajamarca, Trujillo, Pucallpa, Puerto Maldonado, Tarma, Huancayo, Huamanga, Cusco, Abancay, Arequipa. It is estimated that the national protest gathered more than ten thousand people. The object of the protests that took place all over Peru (and in the different countries that signed the deal) is to prevent Congress from ratifying the treaty. The TPP threatens food sovereignty, biodiversity, the environment, Internet privacy and health and labor rights. The videos showed that the protests happened both during the day and at night. It was at night where police fired tear gas into the crowd in an attempt to make the protesters dispersed. The video also showed protesters throwing rocks and shooting fireworks back at the police. Some of the reports are in Spanish, but some of the footage was translated to English via the subtitles. If anything else, the videos show just how diverse people’s concerns are. 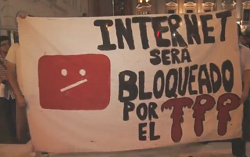 Digital rights and personal privacy are a part of this global protest movement. As of this writing, Freezenet has still not heard of if the government of Peru has mentioned a specific date on when the agreement will be tabled, however, we are still monitoring the situation as closely as we can. Special thanks to @gaudiovisual1 on Twitter for contacting us to share this footage!